Whether it is applied to the windows of an automobile, a home, or a business office space, window tinting film is an inexpensive, attractive, and convenient way to improve the quality of an interior space. Trust us, it doesn’t just amp up the aesthetic of your space. It offers so much more than that. Window tinting films promote privacy while still allowing plenty of light and visibility inside and at the same time, it cuts down on glare from the sun. We all know how damaging and painful it can get when you’re looking out the window and suddenly feel the burn in our eyes due to glare. Furthermore, it helps to keep the heat out during unbearable hot days and if you’re living in cold countries, it keeps the heat in during the winter. Yes, you read that right. Window tinting films work wonders and it’s quite impressive how it can adapt so well in any weather, especially the stark contrast in temperatures during summer and winter. Another benefit of having window tint films is that it can help in reducing the costs of air conditioning and heating. Additionally, not only it blocks sunlight, most window tinting film can also block dangerous ultraviolet rays (UV rays). You may check out our product range that provides up to 99% UV radiation protection. The options are endless in the market right now and as we know it is great to have window tinting films, not all types of window tint film are equally effective in fulfilling the benefits we’ve mentioned. Thus, we are here to introduce the types of window tinting films that are currently available in the market, the materials, specifications, costs, effectiveness etc so that you will have an idea about how to select good quality ones that actually work. It is the least expensive, least functional and the most economical type of window tinting film compared to the others. The dye is just placed in a layer next to the adhesive. Most people who consider dyed films are due to its cost as it is the most affordable for people on a budget. Even though it’s cheap, it does hold some qualities. Dyed films do provide solar heat rejection (although not much) and due to its opaque colour, people prefer it for its appearance and privacy. The downside of dyed films is they do not last long as the dye does tend to fade with time. 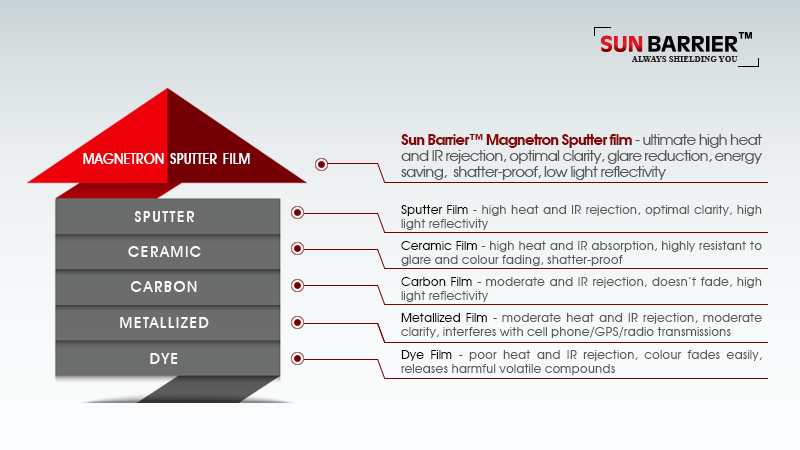 Similar to dyed films, metallized films also provide heat rejection. They are created by applying very thin coats of reflective metal to the tint’s film. This metal layer results in the tint being somewhat reflective while having exceptional heat rejection and blocking UV radiation. Metallized film creates a shiny appearance from the outside. These films are made by vacuum-coating a layer of metal onto the polyester. Then, a clear laminate is applied to protect the metal. After that, it is then sandwiched between an adhesive layer and scratch coat. This provides added safety and privacy with minimal limitations of visibility from the inside of the tinted windows. This metallic content strengthens the window as well. Due to how metallized films are made, your windows will be more shatter-resistant and scratch-resistant. The con is that when used in a vehicle, one drawback of metallized film is the fact that its metallic content has a tendency to interfere with cell phone and GPS transmissions and sometimes, radio frequencies. That is something to take note if you’re interested in this type of films. Compared to metallized films, we personally think that carbon films offer better results. 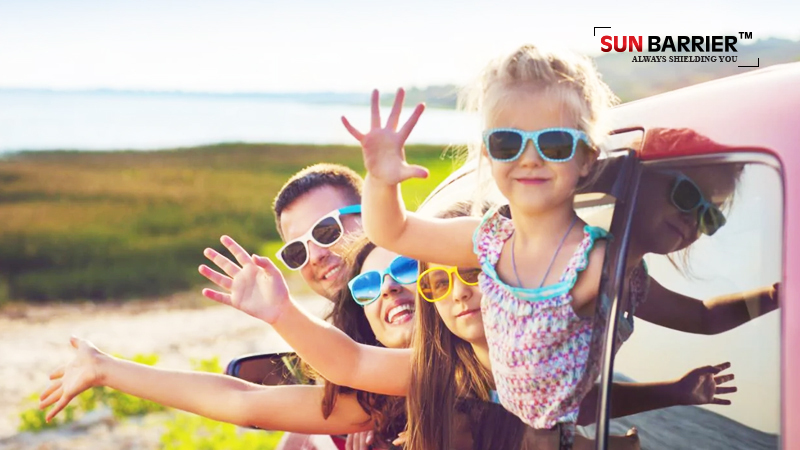 Unlike metallized films, carbon film doesn’t have any metal in it, hence you will not encounter any cell phone, GPS or radio signal disruptions. 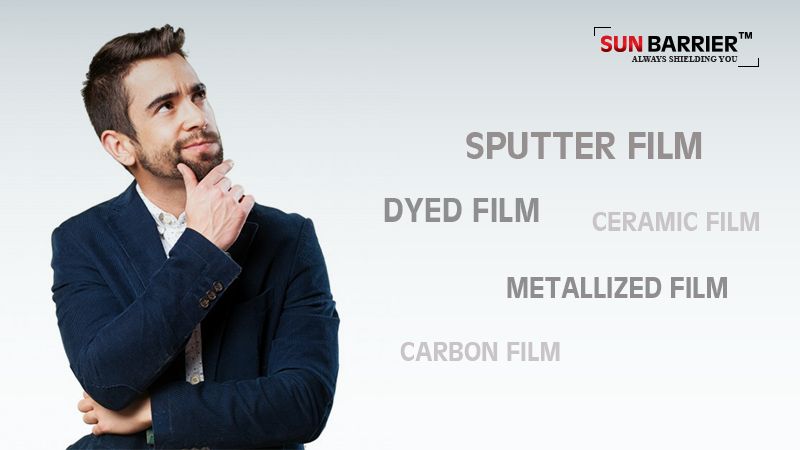 As we’ve mentioned that metallized films has a reflective and shiny look but carbon film is a total opposite. It has a dark and matte-finished so it is a good option for people who are not into the whole reflective and shiny look. We personally think it’s a more tasteful option. Carbon films can block up to about 40% of the solar heat (infrared light) that enters through the windows. It is about as effective as other varieties in blocking heat and guess what? Carbon film will not fade and age (in colours) with time. It is not just one of the highest quality of window tint films but it is also one of the most expensive. It does not contain any metal, dye, nor carbon, but instead a kind of ceramic particle that is both nonconductive and nonmetallic. It is considered as the most (or at least one of) reliable in the market. Ceramic film cuts from 45% to 50% of the solar heat (infrared light) and up to 99% of UV rays that enters through the windows while allowing maximum visibility (both by day and night). Similar to carbon film, ceramic film does not disrupt radios, cell phones, GPS systems etc. In addition, it is highly resistant to glare, colour fading and is shatter-proof. Ceramic film does not interrupt your vision while driving at night due to its outstanding optical clarity.